Jacob is running away from home. He has deceived his brother, Esau, two times, stealing the firstborn blessing that rightfully belonged to Esau. Now Esau is comforting himself with the thought of killing Jacob, so Jacob has been sent away in a hurry by his mother to her family in the land of Paddan Aram. Late one night, when he was tired from all his travels, Jacob found a large stone to use as a pillow and lay down to sleep. Jacob then had a dream. 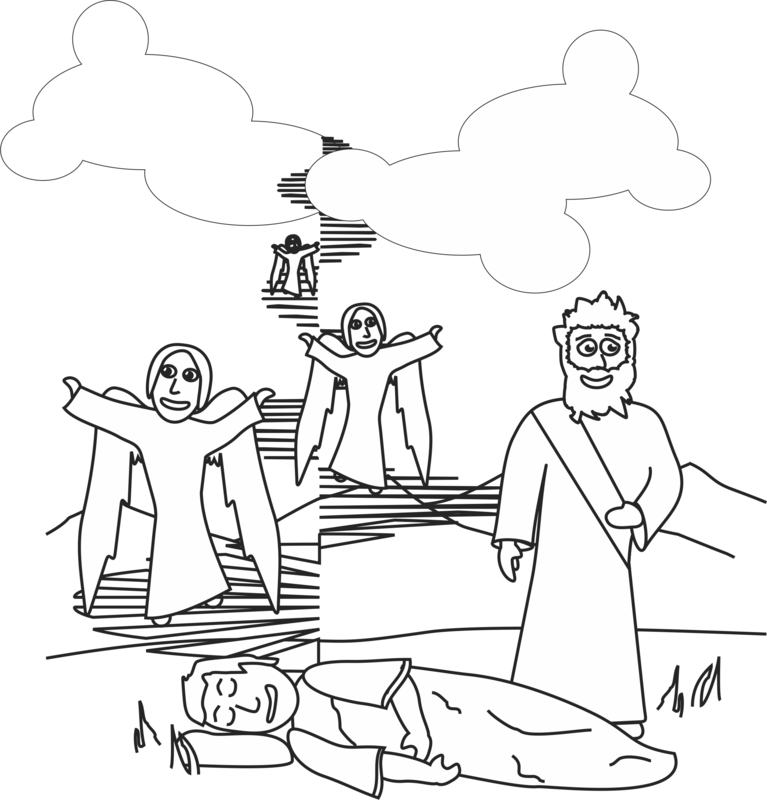 In his dream, Jacob saw a staircase that went up to heaven. Angels were going up and down the stairs and at the top of the stairs was God. God spoke to Jacob, renewing the covenant of Abraham and Isaac with him. God promised Jacob that he would return to the place he was sleeping and that his descendants would be as numerous as the dust of the earth (or grains of sand, depending on your translation). When Jacob awoke and realized what he saw in his dream was real, he set up his stone pillow as a memorial. He declared that place to be the house of God and the staircase the gate to heaven. Then Jacob promised that if God was faithful to him, he would be faithful to God. At the end Jacob promised to give one tenth of all he had to God. 1. If possible, ask the children to sit or stand around a table. Give each child a paper plate. Place a spoonful of sand on each plate. If you have magnifying glasses, you can give them to the children now as well. 2. Ask the children to count all the pieced of sand that is on their plate. Note their reactions. 4. Tell the kids that there is a lot of sand in the world. There is no way that we could ever count them all. In the story they are about to hear, the main character may have similar reactions when presented with the idea of counting all the sand in the whole world! In his dream, Jacob saw a stairway reaching to heaven. This stairway is a connection between heaven and earth, with God at the top, taking the initiative to reach down to man. The stairway is a representation of Jesus, who is God come to earth to save man. Jesus is the only connection we have to God. Jesus says of himself in John 1:51, “Very truly I will you, you will see ‘heaven open, and the angels of God ascending and descending on’ the Son of Man.” We know that the Son of Man is Jesus. The passage being referenced here is none other than Genesis 28 and Jacob’s dream. Through Jesus, God offers us great blessing, just as he did to Jacob . 1. Put your item in a pile in the middle of the group. Ask each child to get 10 pieces from the pile. 2. Using a pile of your own, demonstrate how to make one tenth. Count your items, setting one of them aside to represent the one tenth. 3. Give the children a bigger idea of what one tenth looks like by putting all the items in piles of ten. Emphasize that all the piles are the same. When you have ten piles of ten, count the piles, setting one pile aside to represent the one tenth. Tell the children that Jacob gave one tenth of all he had to God. So, if all of the item that you brought represents all that Jacob had, then that one pile would be what he gave to God. 4. Tell the children that today many people still give one tenth of what they get to God. Ask the children what they get for allowance, if they get any. Ask them what one tenth would be. Encourage them to consider bringing one tenth of their allowance to church to give back to God, just like Jacob did. 1. Pre-class prep: On several pieces of paper, write sections of today's bible verse so that when all the pieces of paper are collected and placed in order, you have a complete verse. Tape these pieces of paper to the stairs. 2. Bring the children to the stairs and let them take turns climbing the stairs, finding the pieces of paper taped to each stair. 3. When all the paper has been found, bring the children back to the classroom and have them work together to put the verse in order. 4. This game can be made more competitive by having two sets of paper (differing colors) and allowing the children to race to get the paper and assemble the verse. First one with the verse assembled correctly wins. 1. 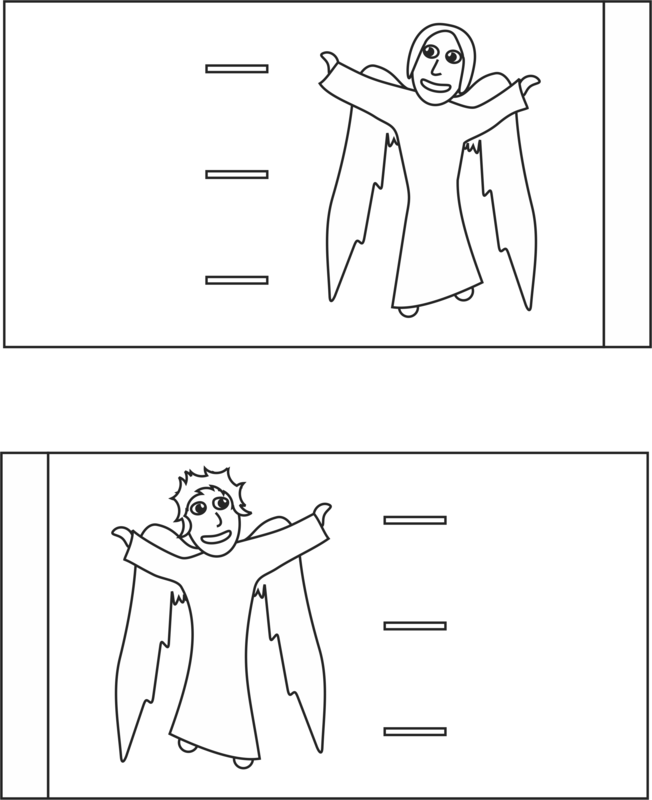 Give each child one angel template to color and cut out. 3. Use the scissors to add the slits in the sides of the roll where it is marked on the template. 4. Insert the large popsicle sticks into the slits in both rolls, so that the rolls are connected by the sticks.